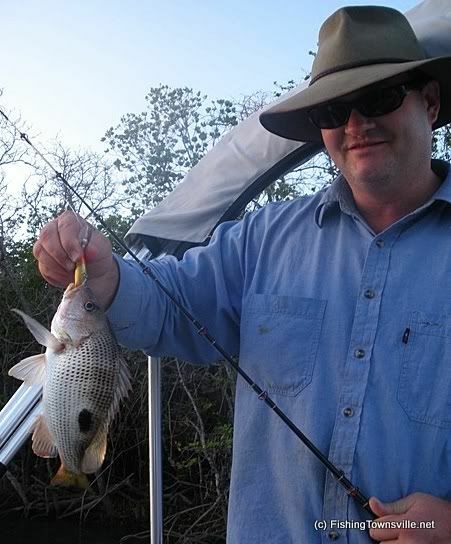 A few weeks ago, in response to ScottNthQld’s post asking for someone to take him luring Jimbo had also mentioned that he would be keen to have an afternoon dedicated to flicking HBs and SPs at snags as something a little bit different to him sinking a live bait. 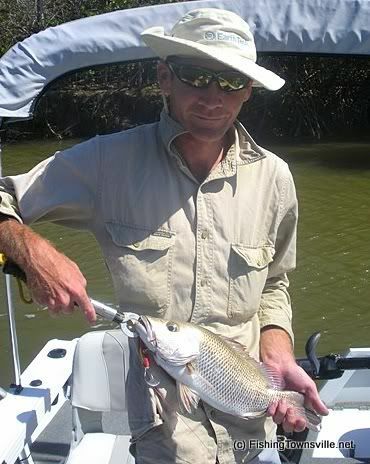 One thing led to another and he’s had commitments for most weekends recently, but the window finally came and so we planned the trip for Saturdays incoming tide at one of his haunts in the Burdekin Delta…. As it turns out it was blowing a gale, so it was always going to be tough to find some snags that both looked fishy and were protected from the breeze. 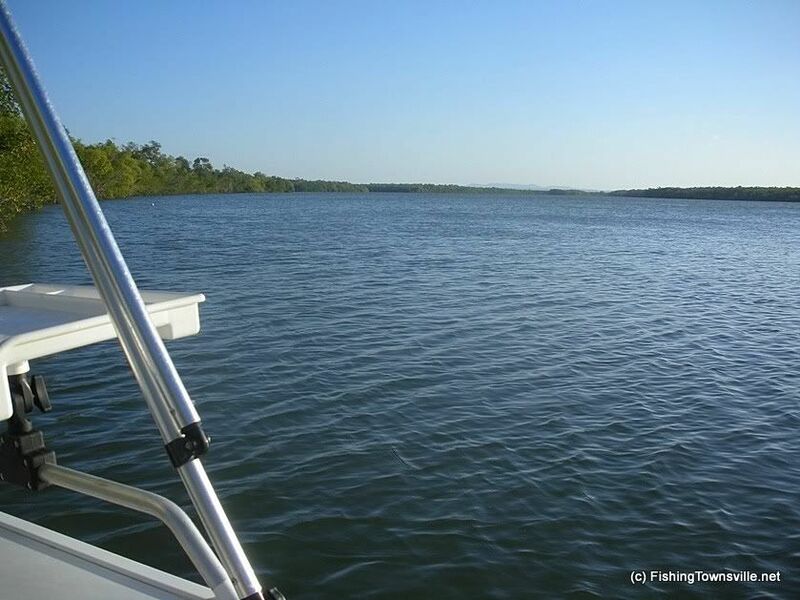 It was a couple of firsts for the both of us, as I tend to fish the outgoing tides in the creeks around Townsville, and until the weekend, Jim had never gone out for an afternoon with the sole intention flicking lures. We arrived and had Jim’s boat in the water by just before 1pm, and the creek looked fishy right from the start… I knew then that regardless of the outcome I would be back in this creek at some stage in the not too distant future, flicking SPs and HBs into the snags on a tide somewhere round the new moon. So… Jim had informed me on the way to the ramp that he had been out Friday afternoon to set a couple of pots, so at the very least we were looking forward to seeing a couple of muddies. The tide was pretty low to start, so we slowly pottered along the little creek from the ramp biding our time by slow trolling amongst the snags with a gold 15+ flats rat 2 and a green and gold shallow diving bomber style lure, interspersed with the flicking of a few plastics into some “deep” water snags… for such a small creek width wise there were some VERY deep holes (up to 18 or 19ft in places), and a VERY bumpy bottom…. Despite this, it was hard work with the SPs and I think we only managed a couple of strikes all day doing the cast and retrieve thing, but that’s fishing I guess. After about an hour and a half we were slow trolling once more, and we were finally on, a good solid strike on my flats rat, before my heart sank… I had been taken into the snags… but some masterful motoring by Jimbo brought us back into the picture and we boated the first, and what was to be the last keeper of the day, a very healthy looking 42cm mangrove jack…..
By about this stage enough water had come back in with the tide, so we ventured out in to the main creek to check the pots, and flicked a few more lures on the lee side of a couple of snags…. Jim had put 4 pots out over night and we were pretty stoked to find 5 good sized bucks in them just waiting for cooking pot J…. We put the pots back out, mainly because we had a few more hours of fishing left to do, and continued to throw our lures into the snags… Again we only managed a couple of touches, and I did manage to get the tail of my prong bitten off, but alas the cast and retrieve just wasn’t working Saturday…. So after a couple more hours we decided to troll around a little before pulling in the pots…. At this point it is worth noting that we had been seeing a heap of turtles about during the afternoon, we figured that they have to be after something (turns out it was probably herring, as they were present in their thousands!!)…. We trolled around and then I was on… well at least I thought so initially… a snag maybe?… I slowly managed to retrieve some line as Jimbo once again exhibited masterful control of his hornet trophy, we got right up to it before it dawned that this was no snag, but quite a large Denison of the deep…. Got a view of the leader, then felt the distinct pull and heard the whirring sound of line screaming from my reel… We managed to get a little closer, until we finally saw colour…. That horrid green of a dirty great big loggerhead turtle!!! We were too slow in cutting the leader, and she was off again… We continued to try to retrieve line with the goal of at least getting to the leader and cutting it there… Alas it wasn’t to be, and after another 5 or so minutes and a worrying time thinking that my rod was going to break, she finally pulled hard enough to break me off… Well at least it made for a good spectacle for another passing boat, who all looked on in awe as they saw my rod doubled over, and I reckon that they would’ve seen the veins bulging on my forehead from the strain even at 100m away!! So not a great success but a great afternoon… One of the things I like best about fishing is the chance you get to explore some great creeks and new territory, and it’s days like Saturday that remind me that we live in a pretty special place up here…. Thanks Jim for a great afternoon, and I will be returning the favor soon…. Whether it’s in one of “my” little creeks up here in Townsville, or I bring my tinny down to Ayr and we do the same again.